We and our licensed affiliates tend to take them for granted as long as they work but once our car’s battery dies out on us we are left with a vehicle that cannot be started or at least one which is much harder to start. It is a common misconception that car batteries can just suddenly die out, there are always tell tale signs which, if we do not allow to go unnoticed, can alert us in advance and allow us to replace our car battery before we are left stranded. In this blog post we describe such signs in the hopes that you will pay heed to them. Most of us start our cars every day, many times more than once. We therefore become quite accustomed to the way our car’s engine fires up, the sounds, how long it takes, the influences of cold weather etc. If you notice any change in the way your car starts it may very well be that the battery is becoming weaker and is approaching the end of its life. 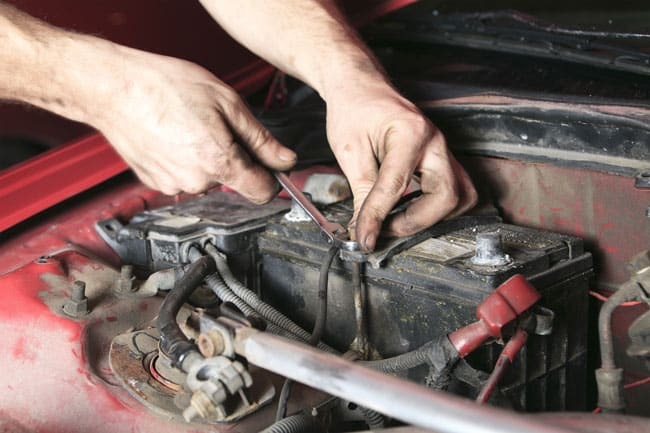 Even if you can still start your car quite easily take a trip to the auto shop and find out what’s brought on the change, it may very well be time to replace the car battery. How long car batteries last varies between different types of batteries and different make and model cars. However, if your car battery is over three years old it is a good idea to have it checked before winter hits. Many people do not know it but the beginning of summer is also a season when older car batteries tend to fail so if your car battery is getting old get it tested at the end of spring too. In modern cars it has become almost completely unnecessary to check periodically under the hood. Still, it is a good idea to do this, you may notice things that will allow you to take action in advance and save you the hassle of getting stranded (low level of coolant for instance). If you notice a buildup of corrosion on the battery terminals it may be an indication that you need to replace your battery, other times it may be enough to remove the corrosion, tighten the connectors and apply some grease onto them. If you notice any of the signs listed above or have any other reason to suspect that your car battery is coming to the end of its life, take a trip to the auto shop and get it tested. You may very well be saving yourself the inconvenience of getting stranded somewhere and having to call for assistance.